Once upon a time there was a beautiful oil company. All day long she loved to run up and down the share price list, laughing and skipping. But one day she was very sad, because she couldn't find an interim dividend anywhere and she knew people would be very angry if she couldn't produce it. "What's wrong, little oil company?" said a gruff voice nearby. She looked around and there was a funny little creature with spectacles, a bald patch and shaving cuts. "I can't find a dividend," she said and started crying again. "Don't worry," said the creature. "I can find you one." "How?" said the oil company, "And who are you?" "I'm an accountant," he said. "As for how I do it, never mind about that. If I do find it for you, you must agree to let me stay with you." "Yes, yes!" she said, anxious only to get the dividend. The accountant disappeared into some books nearby and stayed there for a while. She could hear him muttering and tut tutting and transferring accounts. Then he emerged and put his long sloping hand into hers. "I've found you a dividend," he said. Her usual cheerfulness returned in an instant and she rushed off to tell her father, the Chairman. 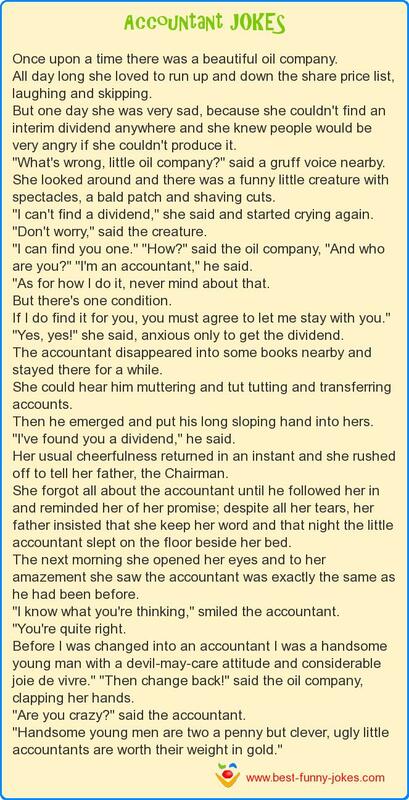 She forgot all about the accountant until he followed her in and reminded her of her promise; despite all her tears, her father insisted that she keep her word and that night the little accountant slept on the floor beside her bed. The next morning she opened her eyes and to her amazement she saw the accountant was exactly the same as he had been before. "I know what you're thinking," smiled the accountant. Before I was changed into an accountant I was a handsome young man with a devil-may-care attitude and considerable joie de vivre." "Then change back!" said the oil company, clapping her hands. "Are you crazy?" said the accountant. "Handsome young men are two a penny but clever, ugly little accountants are worth their weight in gold."